Our next several weeks will be studies about the Miracles of Jesus. I decided to make this lapbook for the students to use as a review after the lessons. I do have the title as Some of the Miracles of Jesus since we are not studying every miracle. Even though we are studying facts of the Life of Jesus such as Malchus, the Resurrection of Jesus and Jesus Returning to Heaven, I did not include them here. 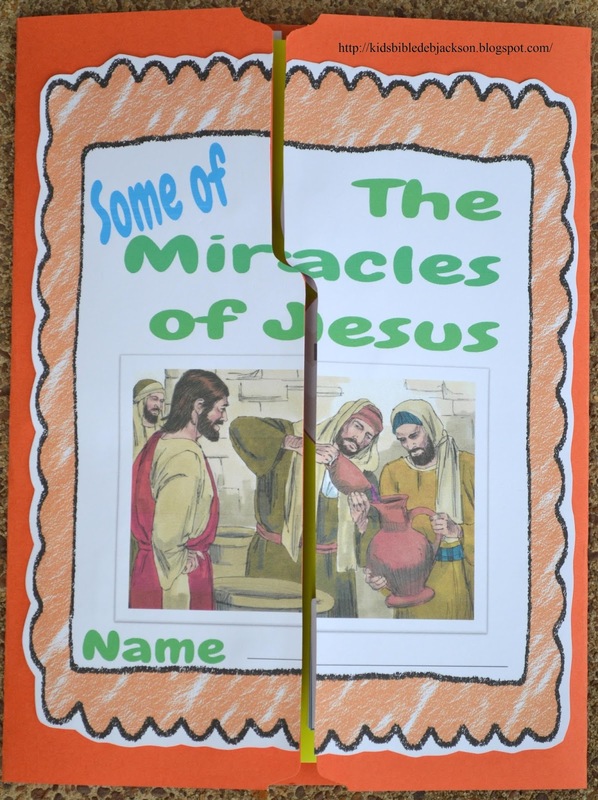 This lapbook will only be used for the Miracles that Jesus did for people to believe in His power, But, you can find more printables here if you want to add other miracles to your lapbook. This is only one of the great things about lapbooks... you make then your own by only using what printables you want to! The first thing to do is print the parts you decide to use. Cut them out, fold them as needed. 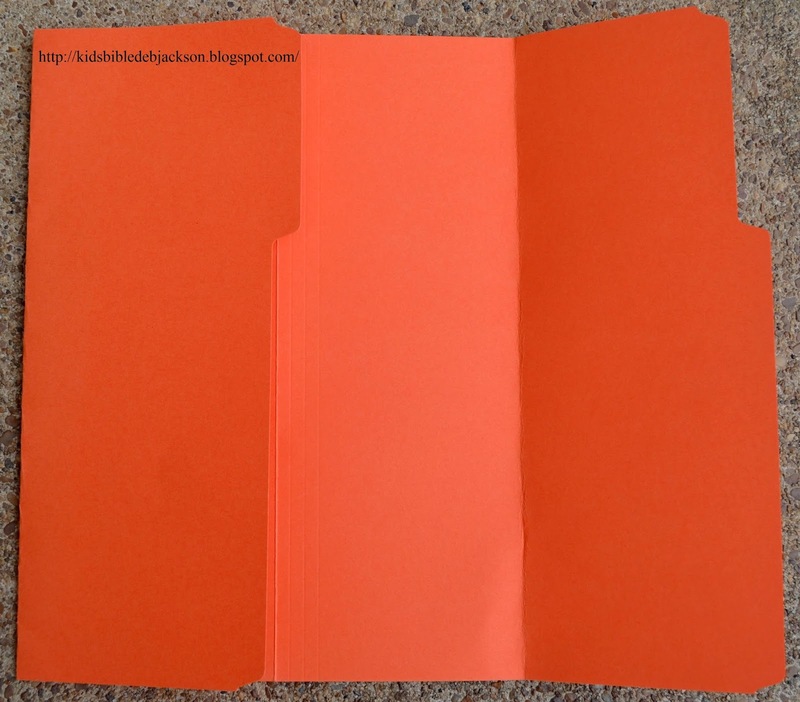 Turn your file folder right side out, so the writing inside will be on the back and not be seen. If you decide to fold your file folder, which I do for almost every lapbook (not file folder games), then looking at the photo above, I fold one side in half to the center fold line, and make sure it is straight along the bottom also. Then, fold the other side to meet in the center, keeping straight along the bottom again. Ignore the tab when folding, you want to use the main edge as your edge to line everything up. Next step is to lay out the parts onto the file folder. I use paper clips so I can turn pages, but still keep everything kinda where I want to put them. I try to put them in order as we will use them and not scattered all over. You can see in the photo above that I need to add a page to this lapbook for everything to fit. I use a piece of cardstock, which I laid along the fold. I usually add the clear packing tape to the edge of the cardstock, then hold the tape backward as I lay the cardstock where I want it, then lay the rest of the tape down. Just see what works best for you. I also add it to the back side so it is less noticeable. You can add pages wherever you like, and use any size. I have added them everywhere, but for class, it is easier for everyone if they are added like this and it looks like a book. Here is the finished inside of what I am using. You can add more pages and add as many miracles as you like. I layered some of the parts so everything fit like this. And, it is a fun, lift the flap style for the kids. For the classroom, I have these made and ready to use. It is a lot of work, but maybe you could have a workday and let other people help you cut and glue, or a teen workday. They can get together for fun, fellowship and work! You can print everything you see in this lapbook here. Healed Down From the Roof! 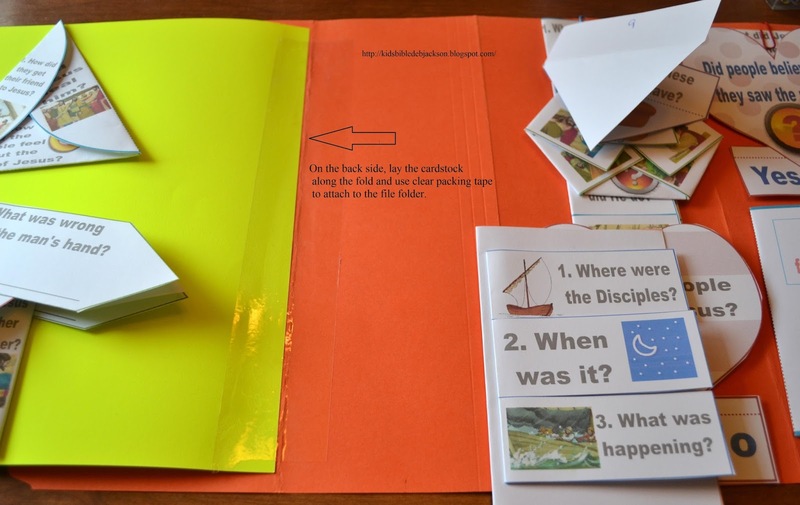 This looks great--I never thought of making a Bible lapbook before! And a free printable too! Love it! Great ideas as always...thanks for sharing with the Thursday Blog Hop! God Bless! Well, thanks for writing it twice! I appreciate it! And thanks so much for pinning! ☺ Glad you stopped by! Awesome! Children will be blessed! Dear Deb, thank you for your wonderful ideas. Love them and I'm having lots of fun teaching my kids with using your lapbook. Was wondering whether you have any assembly for the parables lapbook? Sorry, I do not have any photos for the Parable layout. I used these with Life of Jesus and not on their own. Thanks for your comments! This is so amazing! I'm going to use your idea to teach my children the Bible. Tweeted! So glad you can use it! I really appreciate you sharing! Thank you! I really love your lapbooks! The kids have fun with them! 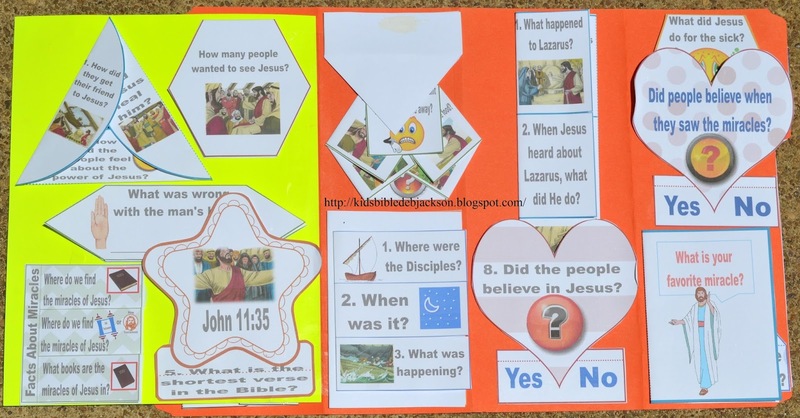 May God bless you:) Do you have any printables or lapbooks about the transfiguration of Jesus? Hello, sorry, I do not have anything on the transfiguration, not even a lesson! Although, it is on my list. 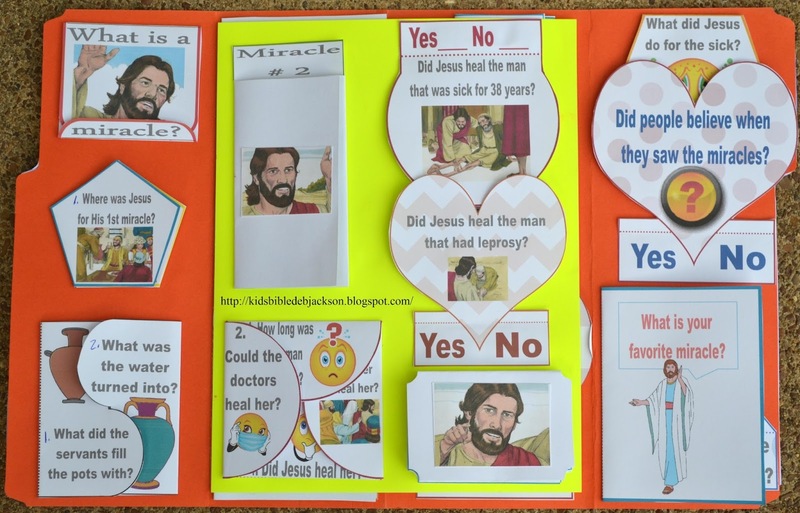 If you are doing Life of Jesus, I can email you an incomplete newer updated set of lapbook printables for Jesus. I work on it randomly and everything is not complete, so it is not available here yet. But, you can mix and match the pieces. 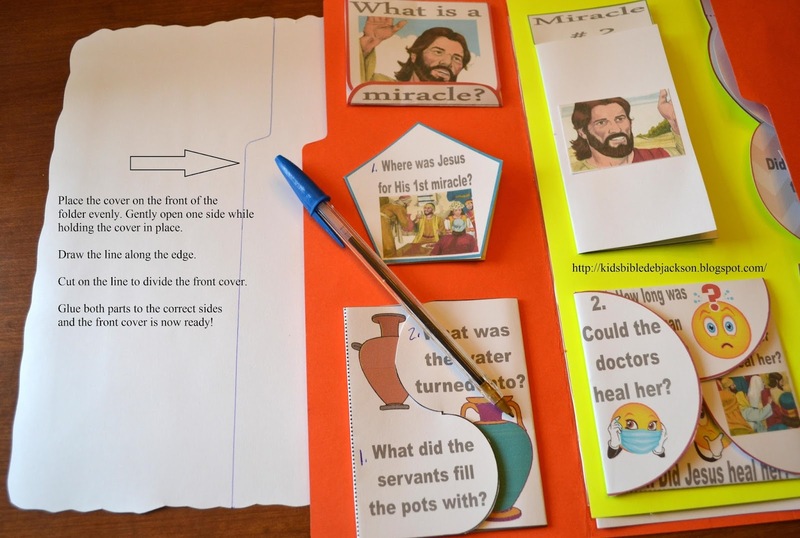 If you are interested, email me at question@biblefunforkids.com with Life of Jesus lapbook request in the subject line or it will probably get sent to spam and be deleted.